The Curry School’s Stephanie Wormington shares how learners of all ages can get past “I’m just not good at that” and unleash their potential. Stephanie Wormington first became interested in education research when she was working in Portland, Oregon schools, including three that lost funding after failing to meet standards outlined in the federal No Child Left Behind law. Seeing some of her students thrive in school despite seemingly insurmountable obstacles launched her on a mission to understand why some students persevere while others retreat at the first sign of challenge – and what she as an educator could do to help support students. 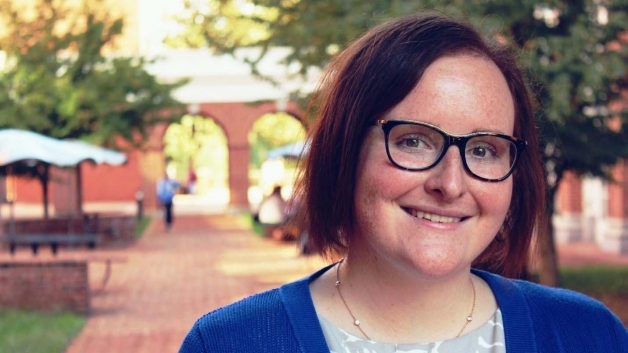 Now, Wormington is an assistant professor in the University of Virginia’s Curry School of Education and Human Development and co-principal director of the Motivate Lab, a unit within UVA’s Center for Advanced Study of Teaching and Learning that strives to improve people’s lives through rigorous motivation research. Wormington is primarily interested in how motivation changes as children and adolescents develop and what bolsters or undermines motivation in school. One of her first projects at the Motivate Lab – and an aspect of motivation that she still researches heavily today – was about “growth mindset”: the belief that skills and abilities are not fixed traits determined at birth, but instead can be developed through practice, effective strategies, and help from others. She recently took some time to elaborate on her research. Q. Why is growth mindset important? A. A growth mindset is important because it shapes how you interpret failure and challenge. Struggling to learn a new concept in math or failing your midterm does not mean you are not cut out to learn and grow in math. Rather than thinking you “just aren’t a math person” and giving up, a growth mindset leads you to reinterpret that failure as a sign that you may need to try a different approach. The same logic applies outside of school. Just because you always slice your golf shots when starting out doesn’t mean you’ll never be a good golfer – it simply suggests that you could benefit from trying out some different approaches for shooting straight. Evidence suggests that a growth mindset is associated with positive outcomes both in and out of the classroom. In academic settings, where most research has been conducted, endorsing a growth mindset is associated with outcomes like enrolling in more difficult classes, getting better grades, and feeling more confident that you can be successful. Research examining the effect of interventions that promote a growth mindset upon outcomes like course grades has found that effects are most pronounced among students who often face the most barriers to success in school, such as students who are underprepared or in remedial or developmental courses. More recent research has started looking at effects of growth mindset interventions on other important outcomes and found effects for higher-achieving students, as well. Q. What is a “growth mindset intervention”? A. In a growth mindset intervention, students learn about how intelligence is malleable and can be developed. Often, growth mindset interventions take the form of lessons about neuroplasticity and strengthening neurological pathways through learning. After reading about a growth mindset, students solidify their understanding through a writing activity, traditionally by describing a growth mindset and its potential benefits to a fellow student. Growth mindset interventions are available both online (such as through a free phone app) and face-to-face and vary in length, with some interventions administered over eight separate sessions and others as brief as growth mindset messages built into Khan Academy lessons. Q. What research are you conducting around growth mindset? A. Right now, most of my work is around exploring why growth mindset interventions are effective in boosting academic outcomes for some students, but not others. We are looking at two main elements related to a growth mindset: the belief itself (believing your ability can improve) and the strategies you might use to improve (asking for help when facing challenge). During one version of a growth mindset intervention that we’ve used in our work, students are randomly assigned to write an essay describing a growth mindset to others, while students in a control condition write an essay about different functions of the brain. The Motivate Lab team codes student essay responses to see what elements of a growth mindset students write about. Then, they evaluate whether those elements relate to how much students benefit from the intervention. We look at whether students who write about both beliefs and strategies related to a growth mindset have better academic outcomes than students who just focus on beliefs, as well as the types of strategies students suggest and which strategies are associated with the most beneficial outcomes. In a recent intervention with more than 1,100 developmental math students at a community college serving primarily Spanish-speaking students, we found that students wrote more about their beliefs related to growth mindset (for instance, “intelligence can grow,” emphasizing effort) more than the behaviors associated with growth mindset (for instance, seeking out challenges or asking for help). We plan to use our findings to make growth mindset interventions more effective for all students. Since students rarely talk about trying out different strategies as a way to grow their knowledge, we are exploring whether we need to emphasize strategy use in our intervention materials to help students come up with a plan for improving their skills once they believe it is possible. We are also investigating how we might work with students to identify effective, evidence-supported strategies for approaching challenging situations. Instead of expending effort on a strategy that does not contribute to learning and growth, like copying over notes from the textbook, students can put their energy into strategies that will help them improve. Q. What have you found most surprising from this research? Despite what you might think, that is actually a detrimental message to send to someone who is trying to learn. If students are studying for hours but using ineffective study habits, hearing from their teacher that they should just try harder does not give them anything different to try. It is the same with hobbies. If someone is trying to pick up a new skill like woodworking, hearing from an expert that they should keep trying is likely to be less effective than learning about specific techniques to employ. I am interested in how to move individuals beyond just thinking about effort to focus on all of the elements of a growth mindset. Q. At what age is it most beneficial to develop a growth mindset and why? A. A growth mindset can be beneficial at any age, but it is most useful when individuals encounter challenge. Developmentally, a growth mindset can become more important around middle childhood, when children start changing how they see the relationship between effort and ability – for example, thinking that if you have to put effort into something, it means you are not good at it. That is the basis of the growth vs. fixed mindset: Do you believe that intelligence is determined by things you can control (like effort, strategies, or seeking help) or by innate ability? Rather than thinking about growth mindset in terms of age, it is more helpful to think about the contexts in which growth mindset is useful, such as situations where you are likely to fail or experience challenge. Q. How long have we known about growth mindsets? A. Carol Dweck started work on growth mindset back in the late 1970s, studying third-graders who exhibited learned helplessness in math (in other words, just giving up). Since Dweck published her book, “Mindset,” in 2006, “growth mindset” has become a buzzword in a lot of schools. However, I believe the research community does not yet have the full picture of what a growth mindset entails in the classroom. To answer that question, researchers need to continue studying how certain behaviors and instructional practices (both in and out of the classroom) support or undermine a growth mindset and translating that work in an accessible way for those outside of educational research. Without good evidence and clear suggestions, it is difficult to ask teachers to completely change their approach to teaching or individuals to completely change their approach to learning new skills. Q. In your opinion, how will our expanding knowledge and adoption of growing mindsets impact the way we teach and learn? A. My hope is that it will impact what learning looks like both in and out of the classroom. For those learning new skills, we can change the conversation around what it means to struggle. Seeking out challenge and persisting after failure – whether it is learning how to write an essay or training for a 5K – should be celebrated, rather than avoided. For teachers or mentors, we need to talk about failure as a positive because it is an exceptional chance to grow. We need to focus on ways to set learners up for success in taking on challenges – how can we change our messages and norms around what it means to ask for help in tutoring or try out different strategies? We can make many exciting changes to help learners, but we cannot make them without strong partnerships with educators. Q. What advice would you give to someone trying to develop a growth mindset? A. Remember that you do not have to change everything at once. Start with one small change, and once you have it under your belt, build from there. For instance, you could start with challenging scripts around what it means to not succeed. If you cannot play that new song on your guitar, you might feel discouraged and think it is pointless to keep practicing. Why not challenge that thought by reflecting back on the progress you have made so far? Once you feel like you can do it, you can brainstorm ways to improve. Work with others on trying different strategies, reach out to a friend or mentor who has more experience than you, and share your ideas and struggles with others. Most importantly, practice some self-compassion – even if you do not get it right away, it does not mean you will never succeed. You just are not there yet. Reminding yourself that you are not expected to learn everything overnight can be the first step toward sticking with a new pursuit even when things are difficult.